The New Year begins with the Judge Abraham Topping Rose house back on firm footing after being lifted by Dawn House Movers on October 21. As the photograph above indicates, the original historic 6/6 windows have been removed and put into safe-keeping before being properly restored. The restoration of the windows will be critical to maintaining the architectural integrity of this Greek Revival gem. 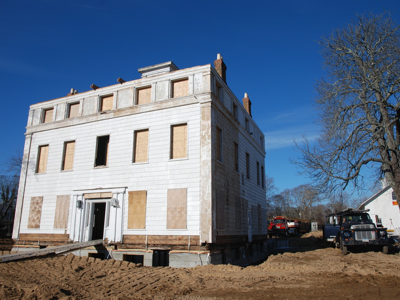 This Autumn’s calm weather on the East End has been extremely conducive to completing the excavation and concrete foundations of the main house, barn and the pedestrian tunnel that connects them. I have received phone calls from friends and colleagues over the past ten days about the roof being removed. The architect, Roger Ferris + Partners, is publicly committed to complying with the Secretary of Interior’s “Standards for the Treatment of Historic Properties.” The next blog entry will examine the existing roof framing and explain the need to construct the new framing for the roof and the planned re-created balcony “widows walk” railing system including handrails, bottom rails, balusters and newel posts to match historical photos.